Ten clever Mini-Mods compete including a sharp knife idea, water intrusion solution, craft beer opener, exploding cabinet countermeasure, anti-dirt system, mud-proof bike storage, something on the level, and more. Welcome to the March 2017 Super Mod Cup Contest. Please review the following ten mini-mods and vote for your favorite. We will announce the winner next week. For more information about the Monthly Mod Contest, including how to enter, click here. We love to take our toys with us when we travel. Our kayaks, strapped upside down to the roof racks, are out of the way and can handle any type of weather. However, our bikes posed a different set of challenges. We used to carry the bikes hanging from a rack mounted to the back ladder. They would need to be removed to get access to the kayaks on the roof. They were also subject to dust and rain which makes a muddy mess. Our Bigfoot camper has a face-to-face dinette that easily makes into a bed. This area should be large enough to carry two bikes. But, how could we hold them in place securely enough for travel? 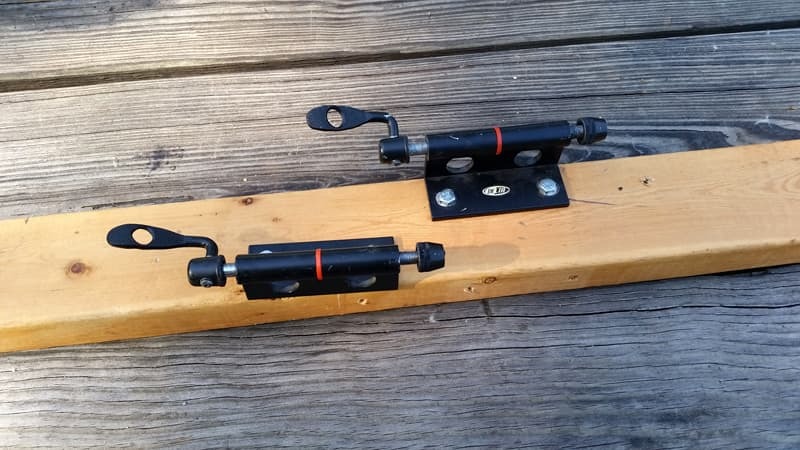 Then I remembered that several years ago I had bought a couple quick release clamps that bolt on the wall. You store your bikes by clamping the front forks into them. I cut a piece of 2×4 long enough to snugly fit between the wall and the lip of the bench seat that holds the cushion in place. Removing the bike’s front wheel (with the same type of quick release) allows the handle bars to be turned 90 degrees. This provides clearance up to the steps and through the door with the back wheel rolling up the steps and into the camper. Then I clamped the mounting bracket into the front fork and lifted the bike onto the bed. After making sure that the handlebars were clear of the window blinds, I lag bolted the bracket into the 2×4. I repeated the same process for the second bike. The 2×4 simply sits on top of the dinette seat and is not fastened in any way. The mounting brackets hold the bikes in place very securely. The front wheels store vertically between the back wheels which can be swung over close to the wall providing additional room for storage or to sit on the edge of seat. There is enough room for the back cushions to remain in place while the seat cushions either fit under the table or on the bed. 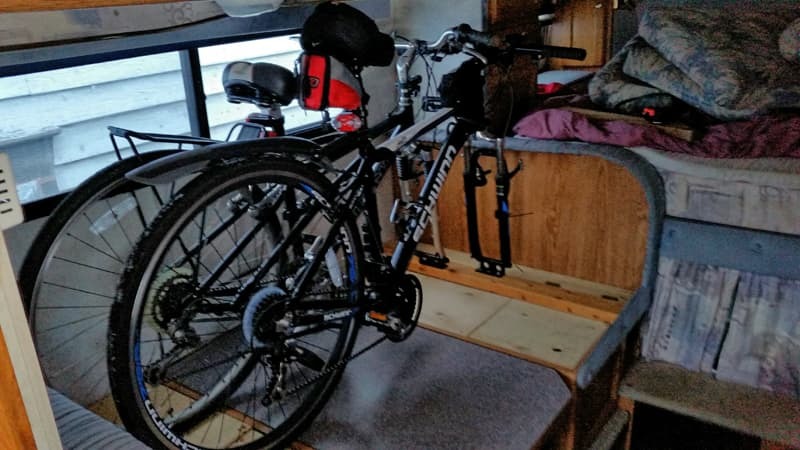 While the bikes are usually the first thing unloaded upon reaching our destination, they can be left in place for an overnight Walmart stay giving us access to everything in the camper except the table. 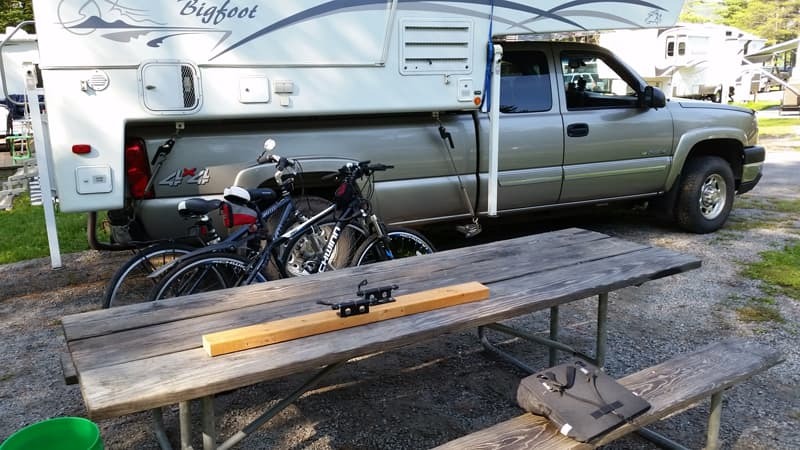 Once the bikes are unloaded, the 2×4 is lifted out and stored under the camper or picnic table. No tools, no straps, no mud, and no more wet bike seats. It took me It took about 15 minutes to make one cut on the 2×4 and to drive the four 1/4-inch by 1-inch lag bolts. The mod cost me nothing because I had everything on hand. You should be able to buy everything for less than $30. In my opinion, the skill level of this modification is easy.